These were the little pieces that I created this week to stimulate the imagination of the students in my Canvas Art classes. Oh how fun to watch the girls create and come up with their own designs or work to emulate one of these. Needless to say I have learned from my students once again. By answering questions and working one on one with each student I glean information that will improve my ability to educate future classes. One of the focuses of this class is teaching my students how to come up with a cohesive design. I am truly looking forwards to teaching my next class and improving on my ability to communicate the principles and elements of design that go in to making each a balanced little piece of art. I hope you can use these to stimulate your own imagination and again these will be packaged to sell as a class kit once I get around to finalizing my web store. I can hardly wait to share this information with any student who wants to learn!!! Teaching - I feel truly blessed! I feel like the luckiest person on the face of the earth when I get to teach stamping classes. Yesterday was one of those days!!! It started at 7:15a and ended at 8:30p when my feet finally went up, but the joy that the day brought was worth every minute of achy feet, legs and hip - LOL! A huge THANK YOU to the wonderful ladies who attended my classes yesterday. I could not believe that many of you would take the time to drive those long distances to come and join me for a day of learning new techniques and playing with new materials!!! Thank you, thank you, thank you for sharing yourselves with me! Art N' Soul is an amazing store. The owner, Susie, and Kathryn (one of her amazing employees) are so kind and generous! 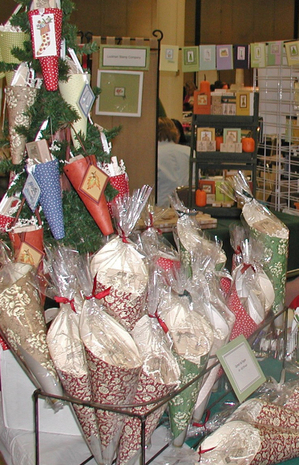 Their willingness to share and help their customers is unsurpassed. AND their store has SO many amazing goodies to drool over. I learned the "philosophy" yesterday behind the name of Susie's store - "art is good for the soul!" I couldn't agree more - it is what has kept me somewhat sane over the last few months. If you have the opportunity to take a class their do it! Their classroom is bright, well lit and spacious - with comfy chairs to boot. (I did drop into one occasionally :D) You will truly enjoy the amazing day with these wonderful women!!! OK - so I'm supposed to be getting ready for the three classes I'm teaching tomorrow, but I just had to take pictures and pop on here to share what I created to share with my students tomorrow. You know how you have something in your mind and then you just need that little push to get on with it. Well last night after talking with Karen Lockhart I just had to stay up and complete this project I started thinking about back in August when I was at Cannon Beach. I had taken all the supplies with me, but never got around to making it. Well here is my latest version of a microscope slide ornament. These wonderful squares are made by Ranger and make it easy-peasy to put these fabulous little treasures together. OK - so I hope the little details show up enough in the photo because it is REALLY hard to capture the etched look together with the shine. Now that I've shared my little treasure I'd better get back to regularly scheduled work - LOL! Last night I decided to take the time for some "stress relief" - for me that is creating. It was a multi-tasking stress relief being that I really needed some thank you cards for some of the amazing people who have helped us through the last little while. I LOVE to color - it brings me back to the days where I had no responsibilities as a child. This little Lockhart Scarecrow with his arms wide open represented the hug I want to give through the mail. The sentiment is from Hero Arts, the decorative paper is from the Memory Box Halloween collection - it is doublesided (brown/orange polka dot), and the brad is a Karen Foster loopy type. Have a wonderful day and please accept this version of my heartfelt thanks to all of you out in cyberworld who have held our family in your thoughts and prayers. I would sincerely like to thank you all so much for sending us your thoughts and prayers. Tests have been coming back with positive reassurance for our 6-yr old daughter. We have now scheduled an appointment with an electrocardiologist at Children's Hospital for November 30th. It will be a long wait, but I feel so much better knowing that Katrina will have a thorough examination at that point. I am so grateful that it appears that our little one will be fine. The "unknown" entity of what happened still frightens me, but I feel much more aware of what can happen and how to handle it. It saddens me to realize that so many children's health is in such a critical state. We have been so fortunate to have the founder of the Cardiac Arrythmias and Research Foundation shooting the "silver bullets" we so desperately needed to remove the fear that gripped our hearts by helping us get answers quickly. What would have normally taken weeks - we had answers within hours. It appears that the educational process is just beginning for this group of heart diseases. Thank you once again for sending us your prayers and positive thoughts. We can still use them, but I am beginning to rest a little easier at night and I just wanted to let you know how much I have appreciated your support. If you are reading this please take the time to read the information shared on the above website - not to scare yourself, but to educate yourself. I share this with you because my hope is that our scare can help save someone else's life. After much thought I have decided to post a brief explanation as to my absence this week. If you have sent me an e-mail and I haven't responded or wanted to place an order and I haven't been here I truly apologize. I have never meant for this blog to be personal - it was to be a source of inspiration for all of you out there as well as a way for me to share my business dreams and goings on with you all. So it is as a business person that I apologize for letting all of that go, but life had other plans for me this past week. Life has thrown some hurdles of a medical nature our way. There is nothing more important to me than my family and I would like to ask those of you who pray to send up a prayer that God holds our family in his hands as we continue to wait for answers to what could be serious medical concerns. For those of you who believe in the power of positive thought please send your positive thoughts our direction. I know that it is a lot to ask without any explanation, but at this time I don't feel comfortable sharing any of the details and therefore I can't be responding to e-mails and questions. But I do feel that I owe an explanation for my absence and the cancelling of classes this week without making too big a deal of it. What I can tell you is that we have had some amazing people helping us, the news we are getting back is very positive and we are starting to relax just a little knowing that it is now a bit of a waiting game. I do know that I will be absent off and on occasionally over the next while until we have this all figured out and I thank you for your patience and support. I will be doing my best to play the "catch-up" game and if you have placed an order I will be trying to get to you over the next few days and get the ball rolling once again. Thank you in advance for the prayers and positive thoughts that will be sent our way. Thank you all so much for sharing with me the type of product you are interested in. Yes, the envelopes are colored and match the notecards. Memory Box really does make a striking product line. 10 notecards/10 envelopes in 18-20 of the colors using the regular shopping cart feature. By special order I will offer the entire product line of colors, because frankly they are all gorgeous - I just have to start someplace without completely breaking the bank - LOL! 25 notecards - this is the best price option - anyone on a budget will really like this option. These will be offered in "seasonal" colors. So hopefully in the next week or two (depending on if I can get the shipping and tax issues working on the site), I will have the colors you could use for Christmas cards - Holly Berry, Dill, Meadow, Squash (gold), Blue Poppy, etc. 6x6 patterned paper - seasonal options and my favorites. 12x12 paper would also be available by special order. Thank you again so much for helping me figure this out!! OK - I've been working long and hard on the website this week (the one with an actual shopping cart) and let me tell you - my brain is FRIED!!! No more over easy eggs in this head of mine - LOL! I sincerely hope that I will be able to open the doors to it in the next week or so. It won't be quite as up-scale as how I first envisioned it, but it will be clean and simple, so it is exciting none-the-less. AND most importantly I hope it meets the needs of all you wonderful supporters who are out here in cyberland!!! 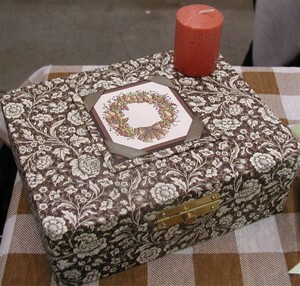 Many of you have been asking me about the Memory Box Company products. I have been using their notecards and papers extensively on the projects I am creating. I LOVE that the interiors of the notecards are white - they look so crisp and professional. I am thrilled to tell you that I will be adding these to my website as well. I do have a question though that I would love to have your feedback. How would you like to see these packaged for sale? Being that I'm in love with the 6x6 assorted patterned cardstock packages I will have those as well! If you don't like commenting on my blog, but would like to give me your input just send me a quick e-mail at ellenhutson@comcast.net. I would truly appreciate getting your feedback on this subject. THANK YOU again for your patience and support while I've been making my way through this maze!!! For those of you who have sent me e-mails regarding ordering the "Nicholas and Daddy" stamp, your stamps are set aside and should be going out as soon as I'm able to complete your order processing. (Can I clone myself - insert big grin). For those who are still interested - don't wait - hopefully I'll be able to give you a count-down soon on how many are left. Again thank you all so much for your amazing support!!! 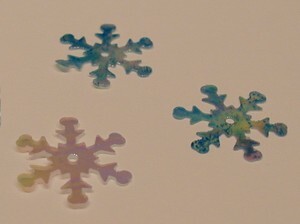 I just wanted to let you all know that "The Flurries" limited edition stamps are sold out. "Nicholas and Daddy" are going fast as well, so if you would like to own one of the Lockhart Stamp Company limited edition stamps from this year please email me with your order soon. Color your image before you punch it out - this will allow you to color right to the edge with an "even" hand. 1 3/8" circle punches fit beautifully within the Creative Candy circles - this allowed me to still have a tiny edge to glitter, but gave me the maximum amount of the stamped image. 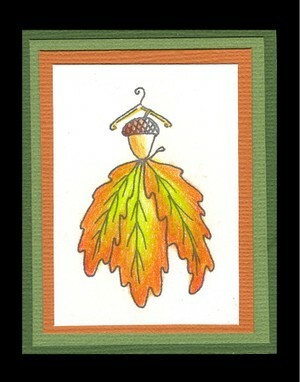 I hope you enjoy the "joy" this card is bringing to my day today! Thank you to all you wonderful ladies (and gentleman - yep there was one Ü) who shared your feelings of gratitude here at my blog!!! I can't tell you how good it felt to read the warmth and tenderness expressed in each of your entries. Each day I have been trying to make it a priority to start my day thinking about what it is that I am grateful for and then ending it on that same note. Positivity (is that even a word - or is it just my word - LOL) in life is hard at times, but it makes such an enormous difference in how we are able to get through the curveballs that are thrown our way. Thank you all so much for joining me and brightening my day! So, as you can see, Taylor is our big winner Ü Congratulations Taylor!!! It always makes me grin when I have my little one "help me". We didn't get to it before bedtime last night and so it was this morning after she was done eating breakfast we started our little "selection process". After telling her that I had another important job for her to do and reminding her of the previous selection she had made she once again asked me., "Mommy, did I do a good job on the last one?" Oh the big smile on her face when I answered her, telling her that she had done a great job just makes me grin again. She then asks me "Why do I get to do it again? Why not Maddi?" I explained that I had forgotten this morning when I was helping Maddi get out the door to school. Would she prefer that I give her sister a turn instead? She grinned from ear to ear and said, "No, not this time. She can do the next one!" LOL! So this morning I told her she needed to pick any number from 1-35. "Any number?" she asks. So she picked "three" and quickly followed up with her favorite question - "did I pick a good number mommy?" Bless her heart - she is such a little ray of sunshine in my life!!! "Yes, sweetie you picked a wonderful number. I know that whoever has that number is going to be so very happy!" With that off she skipped singing a happy tune before we headed to the bus. So Taylor, if you could please send me an email with your address I would love to get your "little something" together and into the mail to you. Thank you for sharing your life with me here in cyberworld!!! I just had to play with the A Muse Creative Candy clear stickers. As soon as we made the monogram in Mary's session I knew that I needed to make ornaments with these. Later as I was looking through the cards that Jen had made in Julie's class I started laughing - guess what she had in her assortment. 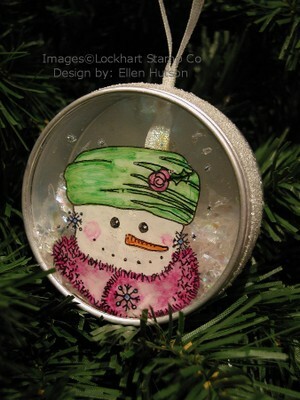 Yep, you guessed it - the cutest little ornament made with a Creative Candy clear sticker. They come in a number of shapes - circles, scalloped circles (these are my favorites - see the keychain in yesterday's post), scalloped squares and scalloped ovals. 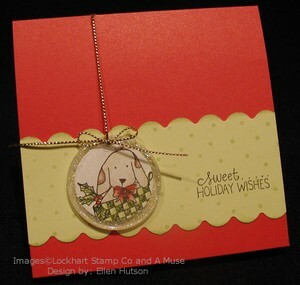 I just couldn't resist putting the sweet little face from the Lockhart Puppy in a Stocking as the focal point of my "ornament" and then I used the A Muse sentiments "Sweet.....Holiday Wishes" and inside "from our house to yours." So sweet and simple. Simplicity - sometimes in my quest to always be searching for something new I forget that simple is good! It is quick and easy, which is what many of us need in today's busy world. 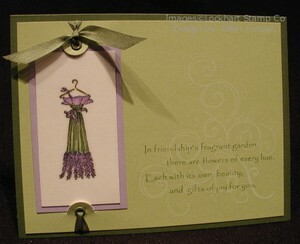 It allows us to whip a card together and get it in the mail. Yesterday inspired me to make a simple card that is easily duplicated. 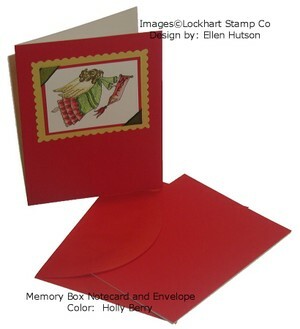 Hopefully they will in turn inspire you to stamp a quick image, color it in and pop it in the mail. 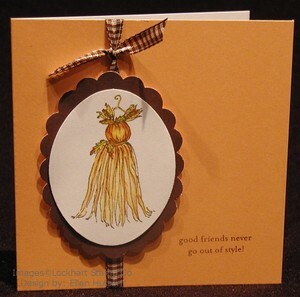 This card layout was inspired by a design Jennifer Pebbles shared in her Frightful and Delightful (I think - oops) session. The dress is the new Autumn Celebration from Lockhart Stamp Company - you can find it in the shop fashion section and the sentiment is one of the delightful A Muse stamps I picked up yesterday. I love how it coordinates with the dresses!!! Unfortunately the camera didn't pick up the little hints of glitter from the Stardust glitter pen that makes the dress highlights shimmer. As you all know I'm a huge fan of the Lockhart Stamp Company stamps (insert big grin). But being a true stamping enthusiast I also dearly love a number of other companies on the market (OK, so it's a little more than just a few), but my loyalties truly lie with just a few who have treated me with generosity and kindness. Today was one of those days that will forever be held close in my memories. I had the amazing fortune to be able to go and “play” at the new A Muse store for their opening gala. After a fun and fabulous morning of card making with Mary Bieber and Jennifer Pebbles, I walked away with 10 snazzy little cards that are truly delightful. I got to hug my sweet friend Julie and wave at her occasionally throughout the morning – watching as she dazzled the ladies with her fab designs. I got to stamp with my dear friend Jen (from San Antonio) and have an amazing lunch with her at a Greek restaurant just down the block from A Muse (I highly recommend this place). 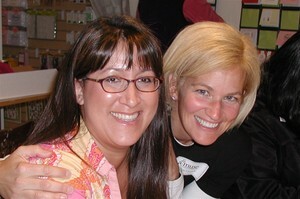 AND I finally had the opportunity of meeting Linda, Heidi, Cindy and numerous other fabulous A Muse ladies!!! This opportunity was one I will always treasure – I can truly appreciate Julie’s respect and regard for the kind and generous owner of the A Muse company. Linda if you happen to be reading this – thank you for making this a wonderful day to remember!!! I am completely sold on the wonderful clear alphabet stamps (the ones with the polka dots are definitely my fave, but I couldn’t resist the ones with the little flowers either). I am truly looking forward to utilizing them in upcoming card making sessions. There are a number of reasons I like them (besides the fact that they are polka dots), but the primary one is “PLACEMENT” – WOWIE – I was able to place it perfectly EVERY time, without slaving over a stamp-a-ma-jig Ü These snazzy new acrylic stamps are really grabbing my attention! I must admit I LOVE the feel of the wood block in my hands and doubt I will ever give those up, but between A Muse, Memory Box and Autumn Leaves… they are beginning to convince me that clear can be good too. 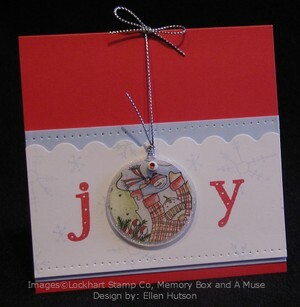 I must also tell you that you NEED to get the A Muse acrylic blocks for your clear stamps. 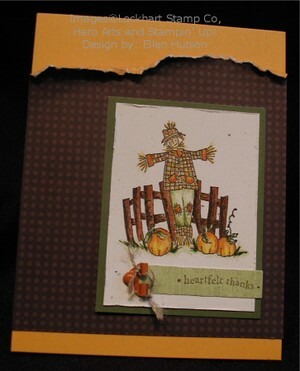 The way Linda has had them designed with the beveled edges really helps give a nice clean stamped image. I now have found two inks that I’m loving to use with the clear stamps –ColorBox Fluid Chalks and also Hybrid Palette inks. Both stamp VERY nicely! Other products that I have fallen in love with that are made by A Muse are the “Creative Candy” epoxy stickers. The ideas are sparking in my head. Thinking about how I can use these makes me bounce up and down inside. This keychain was designed by Linda – total cuteness factor!!! The second are the “Creative Candy” twinkle stickers. A girl can NEVER have too much sparkle Ü These stickers come in four different assortments – mini stars, mini hearts, mini dots, and micro dots. If you haven’t tried them you must. The trick to using these is to slice the adhesive strip that joins them together and then lift them off the sheet with the tip of an xacto knife placing it directly on to your project. That little bling is all a girl needs Ü So tell Linda I sent you to pick up some bling, some stickers, some alphabets and most importantly some stamps (insert big grin). to my fellow Canadian stampers. I haven't forgotten you all!!! For those of you who perhaps might not have known this I was born and raised on a farm just outside of Calgary, Alberta. So in honor of this wonderful celebration and my heritage I would like to host my own little "what are you thankful for" thread. To thank you all for your amazing support I would like to host a little giveaway which will include the following image, along with some other goodies that showcase the wonders of this special celebration and time of year. I am thankful for so many things - first and foremost is my family! No words can ever express how thankful I am for each and every one of them. They are followed closely by friendship, freedom and the many out here in cyberworld who have supported and encouraged me as I begin my new career path. There are so many more things that I'm thankful for, but I might be writing all night if I were to truly delve into expressing myself and I don't think you'd all stick with me through it all - LOL!!! So everyone (there is no requirement as to where you live or what country you are a citizen of) post a short sentence or two and please share something that you are thankful for and join in the fun! I'll have my girls pick a number on Monday evening and will post Tuesday morning who the lucky winner of the goodie bag is. 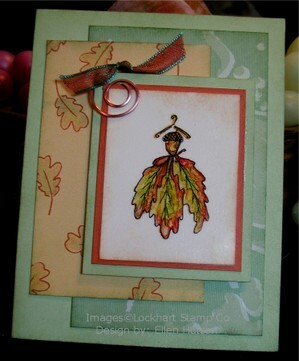 What a fun idea Paper Crafts has come up with to celebrate the joys of making cards. If you haven't heard tomorrow is the official beginning. Read more about it at Paper Crafts blog. You can also enter to win some prizes and see the new projects that will be posted hourly by visiting their website between 10a and 10p Eastern Time. To join in the fun I am taking the opportunity to head on over to A Muse for their grand opening gala. WOOHOO stamping with some of the A Muse crew and hopefully getting in a hug (or two) from dear, sweet Jules - what could make for a better way to kick off this fun event! Perhaps next year I'll actually have the time and energy to put together something for my local stamping customers - I think it would be awesome fun to host an all-day stamping event! Perhaps a lot of work, but also a whole lot of fun!!! So hopefully I'll have some fun pictures to share with you all tomorrow night Ü Off to pack my stamping kit and hopefully get a good nights sleep because tomorrow is going to be rockin' ladies! This is the last sample before I head out for class tonight. We are going to continue playing with transparencies and vellum tonight. That is why I have two lovely dresses posted the last couple of days - LOL! So if you are taking my class tonight I hope you don't see this until after :D But I knew I'd be too tired to post once I got home. I still need to post the dresses I shared in Minnesota - I haven't forgotten you ladies. It's just life's whirlwind has me spinning. Here is one of tonight's dresses. It is soooo tough to get a decent photograph of work done on transparencies. Who can guess what medium we are playing with tonight to color these in? If I have already shared this with you then you can't post - but if you haven't been told, then post your guesses below. I'd be interested to see how many others have been playing with this fun "stuff". One last little note - I LOVE the SCS sketch challenges when I'm in a hurry. I just hurry over to the site, see what the last sketch is and incorporate my image into the layout. Makes for very little brainwork on my part other than balancing the layers. This one was a little tricky because of the contrasting colors and the fact that I really wanted to use the green Memory Box patterned cardstock. I just couldn't come up with another one to coordinate and so I had to make my own stamped pattern on the squash colored cardstock. To blend them all together I took some prisma's and just colored in the leaves. I also had to sponge - which I typically don't do much of, but I do believe it turned out OK. I had this idea in my head for a submission and of course with all my other deadlines didn't get it done. So instead of waiting to submit it at another time I thought I'd just share it here and use it for the class I'm teaching tomorrow night. First I must say that I'm in LOVE with the Rhonna Farrar clear stamps swirls v.2. They make the most incredible backgrounds for the lovely new Lockhart Petit Le Fleur dresses. Then combining them with one of my all time favorite sayings - well I'm just so excited with how this turned out. I also would like to share with you the wonders of the new Palette inks I have recently purchased. If you are looking for them let me know and I can add them to my "store". 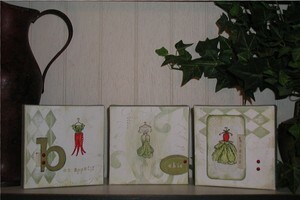 I can not tell you how much I LOVE the soft white called New Canvas that I used for the background flourish. It is soft, subtle and totally what I was looking for. I then used my absolute favorite green (Landscape) for the saying. Add some gorgeous silk ribbon with the lovely image to make it the focal point and voila - I'm loving how pretty this looks IRL. The layout is simple but the effect is exactly what I wanted :D I'm so very happy when that happens. One more tidbit that may be of interest to those who are not familiar with the clear stamps. Many find inks tricky to select with these products - well I will vouch for Palette inks on the clear acrylic stamps - they stamped beautifully! No problems whatsoever. I stamped on cardstock, vellum, and transparencies with this ink and the clear stamps and each and every image came out clear and crisp. WOOHOO!!! I hope this inspires you to try new things and new products! Creating these funky little designs is so much fun! 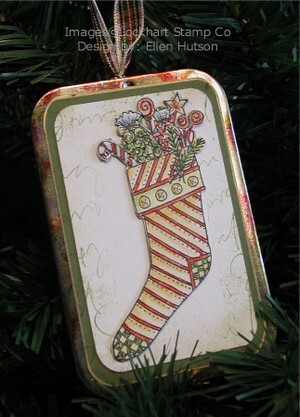 This is the other ornament I will be teaching for my Enchanting Ornaments class at Make an Impression. I so appreciate the many of you who have contacted me regarding the three different ornaments I have created in the last few weeks (Ornamental Place Card, Enchanting Snowgirl and Stocking Stuffer). After some contemplation I have decided to put together Class Kits. It will have everything you will need to complete the project along with a step by step tutorial with how to make each project. As I am already completely "snowed" under with things that need to get done it might be a few weeks, but hopefully with some determination (and luck) I will soon have this information prepared and ready to roll in time for you all to purchase and complete these projects before Christmas. I do have a question for you though. 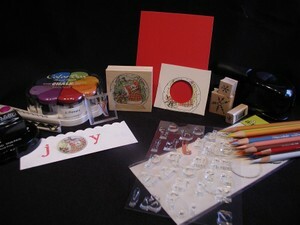 If you were to purchase the kit how many projects would you like to be able to complete with the supplies enclosed? If you could comment below or send me an e-mail it will help guide me in putting together something that you will find useful. instructions and all the necessary supplies to complete one project. instructions and all the necessary supplies to complete three projects. instructions and all the necessary supplies to complete six projects. add-on kits (these kits would only contain the products need to make additional projects - they would not contain the instructions or the base/core products that you would need to start). Thank you so much for your excitement and support!!! ...well not really, but being that the holidays will be upon us before we can blink our eyes I'm prepping for my ornament class. 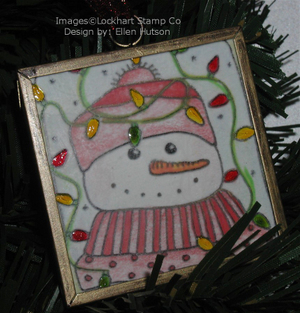 The snowman was stamped using the hybrid Palette inks and unfortunately my experimentation did not allow me to use Sharpie's on the ink even after heat setting. So I needed to resort to the flip side and all worked out well. Start thinking about the gifts you would like to give this Christmas and if you'd like to know how to make these ornaments I'd love to have you join me for classes at Make an Impression.